AFTER AN entertaining yet challenging 2017 season, the Warrandyte Football Club will head into the summer break with belief that 2018 can bear greater fruit. Finishing the season in 11th place with three wins, it was decided the senior side needed to take a new direction despite avoiding relegation. Senior head coach Peter Muscat departed after two seasons at the club, and the Bloods were quick to announce the new man for the job. Anthony McGregor will be the man to lead Warrandyte into battle for 2018, bringing an impressive portfolio of playing and coaching experience to the position. McGregor, formally chosen with pick 28 in the draft by Fitzroy, played alongside club greats such as Paul Roos and Alistair Lynch before injuries prevented him from relocating to Brisbane following the famous merger. Following his playing days, McGregor took the position of head coach at Reservoir, and took a team on the brink of folding into a stable position. McGregor then coached the Bundoora Football Club reserves, taking them to a grand final, while also assisting in the senior premiership. With years of experience in the northern football system, McGregor now brings his talents into the EFL, and is excited to take charge. “I’m really looking forward to it. “I’ve met Pete Hookey (club president), he’s a fantastic fella and he’s got the club at heart. “When you have someone at the top who loves it so much, when you’ve got people at the top who do care about the club, once that filters down good things really happen,” McGregor said. McGregor believes that capitalising on the youth down at the club will be important, and hopes to craft a game plan the youngsters will get behind. “There’s a great amount of youth, so I think that simplifying the game plan, getting a basic plan we can execute, simplifying rotations et cetera is the way to go. “Looking from the sideline, I want to get the youngsters to enjoy it a bit more and with that will come success. “When you start from scratch, to put a win/loss goal on it would be foolish. “Maybe adding a few bigger bodies will make that turn around quicker, but I think it’s about getting that sense of camaraderie. “There’s youth on this team who are going to be, hopefully, together for a few years, so the opportunity is there to mould and build a very competitive team,” McGregor said. On the field, the Bloods played their final game of the season against Scoresby, and while the Seniors fell, the Reserves won a real arm-wrestle to cap off an admirable campaign. However, the day took on greater significance, as Jake Bentley called time on his Bloods career. A club stalwart and always a tough competitor, the value of Bentley’s leadership over the past few seasons cannot be underestimated and it’s no doubt he will be sorely missed. Unfortunately, the senior side were unable to turn the tide after a slow start, remaining goalless to halftime. Scoresby were able to control the tempo and ran out convincing 47-point winners, 9.15 69 to 3.4 22. The result left Warrandyte 11th on the EFL ladder on 12 points, ten above East Burwood who finished the season winless. The Reserves were able to earn a thoroughly deserved win in their season closer, holding off Scoresby to record a 13-point win, 5.7 37 to 3.6 24. Finishing 6th on the ladder on 32 points after notching eight wins, the reserves were within touching distance of finals and can give themselves a pat on the back after a truly excellent season. Footballers can now enjoy well deserved rest over the off-season, and gear up for a pre-season which promises much leading into season 2018. 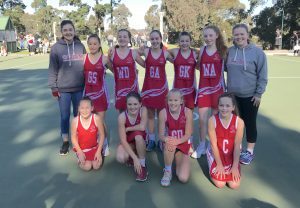 WOMEN’s FOOTY is a big hit in Warrandyte and although the Bloods may not have a team in the Victoria Amateur Football Association (VAFA) Women’s Premier division, Warrandyte locals are making a big impact with four of our girls playing for the Marcellin Sheagles. Nat and Zoe Macdonald, Lexie Hipwell and Taylor Padfield, all friends who have grown up together, made the decision to play women’s football this season and have reaped the rewards. The Diary met with the girls, and Lexie told the Diary how the four of them ended up playing footy. “My intent was never actually to play footy — I mean I wanted to, but Dad was a bit worried, and I didn’t want to do it by myself. “But Nat got me into it,” she said. Nat acted as somewhat of a ringleader for the group, and Marcellin can be thankful that she did. In Lexie, the Sheagles gained athleticism, a strong presence in the ruck and long kicking ability. Zoe’s strengths lie in the backline, with a good ability to mark and win the ball at ground level, while Nat acts as a speedster in the middle and excels at clearing packs. “My friend Maggie was asking me to come down and play for the Marcellin Seniors, she said that it was a new team with some good quality and that in the first year we might struggle a bit so that I would play 80 minutes. “But the team actually turned out alright and we’ve gone on from there,” Nat said. The Sheagles first grabbed attention after competing in the in VAFA’s Lightning Cup back in April. Despite going in with low expectations, the Sheagles managed to win their four games, before advancing to the Grand Final and taking the tournament. “There’s 40 new teams that have come in this year, and this was a chance to expose the girls to matches because they didn’t want the girls to come out underdone for the season. “We played St Mary’s in the final and we just got it done,” Zoe said. Results in the Lightning Cup and performances in grading games have placed the side in VAFA’s Premier Division, and though the girls thought they might be out of their depth, the reality has been anything but. “Our first Premier game was against Brunswick, and everyone thought we would get done by 60 points. “It was a wet game, we went out and we weren’t too confident, but we kicked the first and went from there,” Nat said. The Sheagles currently sit in 3rd position on the ladder, only percentage below the two teams above. “We’ve actually been really good, we even won our game in round three by 60 points. “I think we were all a bit worried because everyone was talking up Premier, but we’ve been playing well,” Lexie said. Playing in Premier division has further advantages for the Warrandyte women, with scouts and coaches keeping a close eye on the games. “There’s some great players in the Premier division and there were even scouts at the Lightning Cup, so its definitely a platform for the AFLW. “Each game we are improving, not just working on skills but also on tactics, so we are only going to get better,” Zoe said. Coach Tom Stafford and Assistant Coach Luke Boyd are certainly in luck with their Warrandyte contingent, who have without doubt played a major role in the Sheagles rapid rise.